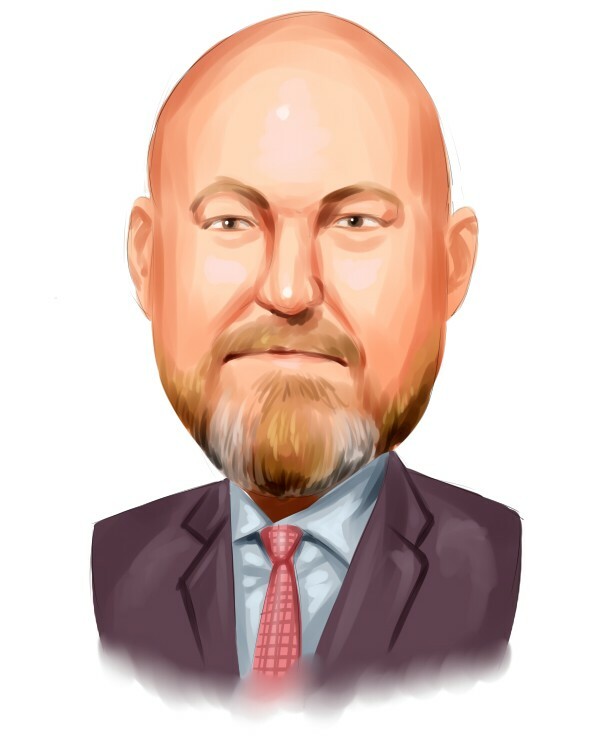 Delta Air Lines, Inc. (DAL): Are Hedge Funds Right About This Stock? Before we spend days researching a stock idea we’d like to take a look at how hedge funds and billionaire investors recently traded that stock. S&P 500 Index ETF (SPY) lost 13.5% in the fourth quarter. Seven out of 11 industry groups in the S&P 500 Index were down more than 20% from their 52-week highs at the trough of the stock market crash. The average return of a randomly picked stock in the index was even worse. This means you (or a monkey throwing a dart) have less than an even chance of beating the market by randomly picking a stock. On the other hand, the top 15 most popular S&P 500 stocks among hedge funds not only recouped their Q4 losses but also outperformed the index by more than 3 percentage points. In this article, we will take a look at what hedge funds think about Delta Air Lines, Inc. (NYSE:DAL). Delta Air Lines, Inc. (NYSE:DAL) has experienced an increase in hedge fund sentiment lately. Our calculations also showed that DAL is among the 30 most popular stocks among hedge funds, ranking 25th. We’re going to check out the latest hedge fund action surrounding Delta Air Lines, Inc. (NYSE:DAL). How have hedgies been trading Delta Air Lines, Inc. (NYSE:DAL)? At the end of the fourth quarter, a total of 73 of the hedge funds tracked by Insider Monkey were long this stock, a change of 9% from one quarter earlier. 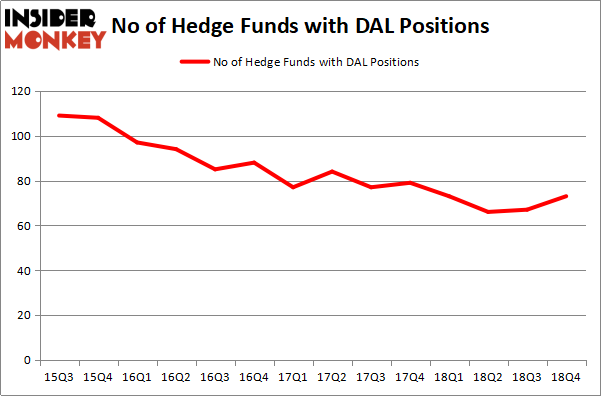 The graph below displays the number of hedge funds with bullish position in DAL over the last 14 quarters. With hedgies’ sentiment swirling, there exists a select group of noteworthy hedge fund managers who were increasing their stakes meaningfully (or already accumulated large positions). More specifically, Berkshire Hathaway was the largest shareholder of Delta Air Lines, Inc. (NYSE:DAL), with a stake worth $3270.2 million reported as of the end of September. Trailing Berkshire Hathaway was Lansdowne Partners, which amassed a stake valued at $1267.6 million. PAR Capital Management, Two Sigma Advisors, and AQR Capital Management were also very fond of the stock, giving the stock large weights in their portfolios. As one would reasonably expect, specific money managers have jumped into Delta Air Lines, Inc. (NYSE:DAL) headfirst. Arrowstreet Capital, managed by Peter Rathjens, Bruce Clarke and John Campbell, created the most outsized position in Delta Air Lines, Inc. (NYSE:DAL). Arrowstreet Capital had $33.8 million invested in the company at the end of the quarter. Stanley Druckenmiller’s Duquesne Capital also made a $31.3 million investment in the stock during the quarter. The following funds were also among the new DAL investors: Crispin Odey’s Odey Asset Management Group, Paul Marshall and Ian Wace’s Marshall Wace LLP, and Matt Simon (Citadel)’s Ashler Capital. Let’s also examine hedge fund activity in other stocks – not necessarily in the same industry as Delta Air Lines, Inc. (NYSE:DAL) but similarly valued. These stocks are Kinder Morgan Inc (NYSE:KMI), Prudential Financial Inc (NYSE:PRU), Royal Bank of Scotland Group plc (NYSE:RBS), and Fidelity National Information Services Inc. (NYSE:FIS). All of these stocks’ market caps match DAL’s market cap. As you can see these stocks had an average of 29.75 hedge funds with bullish positions and the average amount invested in these stocks was $936 million. That figure was $6626 million in DAL’s case. Kinder Morgan Inc (NYSE:KMI) is the most popular stock in this table. On the other hand Royal Bank of Scotland Group plc (NYSE:RBS) is the least popular one with only 3 bullish hedge fund positions. Compared to these stocks Delta Air Lines, Inc. (NYSE:DAL) is more popular among hedge funds. Our calculations showed that top 15 most popular stocks among hedge funds returned 19.7% through March 15th and outperformed the S&P 500 ETF (SPY) by 6.6 percentage points. Unfortunately DAL wasn’t in this group. Hedge funds that bet on DAL were disappointed as the stock returned 3.3% and underperformed the market. If you are interested in investing in large cap stocks, you should check out the top 15 hedge fund stocks as 13 of these outperformed the market.